This book is the result of more than 25 years spent in developing the program of instruction in structural dynamics at the University of California, Berkeley, Understandably, the material has undergone considerable revision -during that time. Three different sets of notes have been. prepared and distributed to the classes at widely separated intervals, and local versions of these have been used as class notes in the curricula presented at such diverse locations as Santiago, Chile, Trondheim, Norway, and Tokyo, Japan. In the initial organization of this material, Professor Clough was strongly influenced by the lectures presented by Professor R. L. Bisplinghoff at the Massa-chusetts Institute of Technology, and he acknowledges his indebtedness to that superbly prepared course on the dynamics of airplane structures. Subsequent orientation of the text toward civil engineering problems in structural. -dynamics reflected the, work-of Hohenemser and Prager in their pioneering treatise “Dynamik der Stabwerke.’ ” Similarly, Professor Penzien acknowledges the great benefit he received from the lectures on random vibrations given by Professor S. H. Crandall at the Massachusetts Institute of Technology. The continuing development of this subject matter, however, has been essentially the work of both Clough and Penzien. Contributions to the literature by numerous writers have been incorporated appropriately into the sequence of lectures; most such contributions are so well established in the field of structural dynamics that it is difficult to assign credit for them. Consequently, few credit references are given, and the authors offer their apologies to those who may feel slighted. Although this text material has undergone continuous revision during its development, the general organization has remained unchanged. The logical transition from structures with a single degree of freedom, to generalized single-degree systems, to the mode-superposition analysis of multidegree discrete-coordinate structures has provided a simple route for the “statics” trained structural engineer to follow in being introduced to the special problems arising from dynamic loadings. Moreover, it has always been considered essential to emphasize transient dynamic response analysis rather than to be concerned only with vibration analysis. As a prerequisite to the study of structural dynamics, it has proven effective to require a solid background of static structures theory, including matrix methods, and it is assumed that the readers of this1text have had such preparation. Probably the most obvious and far-reaching change that has occurred during the development of this text material has been the acceptance of high-speed digital computers as a standard tool for structural analysis. Before computers were widely used in structural offices, major emphasis in structural dynamics was placed on efficient methods for slide-rule and desk-calculator analyses. Such methods still have a prominent place in this text because the authors are convinced of their value in the study of the subject. It the details of a hand-solution procedure are thoroughly understood, it is not difficult to write or use a corresponding computer code, but it may be impossible to use a “black box” computer program effectively without knowing the computational details. Nevertheless, it is recognized that any significant, practical dynamic response analysis requires so much numerical effort as to be economically feasible only by computer. Therefore, the solution techniques emphasized herein are generally those that may be employed effectively with, a high-speed computer as well as by hand. The purpose of the presentation is to explain the basis of the methods; coding techniques and efficient computer usage are not discussed in detail. The subject matter of this text is the basis of a sequence of graduate-level quarter-length courses given at the University of California; however, most of it could be covered just as well at the advanced undergraduate (fourth-year), level. The basic course on dynamics of structures treats the material in Part I and hi Part 2 through the first sections of Chap. 14. It is expected that nearly all Masters-Degree students in structural engineering should have at least this much contact with the dynamics field. The subsequent “advanced” structural dynamics course treats the ‘remainder of Part 2 and all of Part 3. In addition, much of the earthquake engineering material in Chaps. 26 and 27 is presented in these first two courses to provide practical application the theory. The basic material of Part 4 is covered in a single-quarter course on random vibration, together with some of the earthquake-engineering applications from Chap. 28. 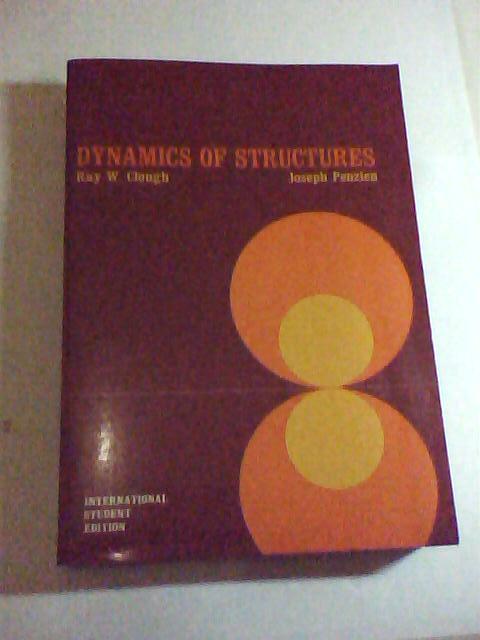 Finally, the entire book serves as background and reference material for a course on structural design for dynamic loads; the prerequisite for this design course is the basic course on dynamics of structures. Although the frame of reference for most of this material is the field of civil-engineering applications, the same basic techniques of structural dynamics are applicable in aerospace engineering, naval architecture, automotive, engineering, and any field in. which structural, systems. are subjected to dynamic loads. A large number of examples have been incorporated into the text because the authors have found that much of this material may be taught most effectively by that means. Moreover, many homework problems have been provided with most of the chapters because it is essential for the student to actually make use of these analytical techniques to master them fully. However, such problems must be assigned sparingly because dynamic-response analysis are notoriously time consuming. The authors have found that from one to four problems may constitute an adequate weekly assignment, depending on the subject matter and type of solution procedure required. Consequently, the book includes many more problems than can be assigned during a one-year sequence of courses on structural dynamics.